We see two main effects (x1 & x2) in addition to the interaction term (x1#x2). Is it “legal” to omit one or both main effects? Is it really necessary to include both main effects when the interaction is present? The simple answer is no, you don’t always need main effects when there is an interaction. However, the interaction term will not have the same meaning as it would if both main effects were included in the model. We will explore regression models that include an interaction term but only one of two main effect terms using the hsbanova dataset. We will begin by looking at a model with two categorical main effects and an interaction. We will refer to this model as the “full” model. This model has an overall F of 11.05 with 7 and 192 degrees of freedom and has an R2 of .2827. Now, let’s run the model but leave female out of the regress command. This model has the same overall F, degrees of freedom and R2 as our “full” model. So, in fact, this is just a reparameterization of the “full” model. It contains all of the information from our first model but it is organized differently. This shows that Stata is smart about the missing main-effect and generated an “interaction” term with four degrees of freedom instead of three. Thus keeping the overall model degrees of freedom at seven. In this case, the coefficients for the “interaction” are actually simple effects. For example, the first “interaction” coefficient is the simple effect of female at grp equal to one. It shows that there is a significant male/female difference for grp 1. We could get the same four simple effects tests from the “full” regression model using the following Stata 12 code. What if we ran the regression including just the main effect for female? Again, this model has the same overall F, degrees of freedom and R2 as before. So, it is a different reparameterization of our “full” model. This time the “interaction” coefficients are simple contrasts. To get the three degree of freedom simple effects we need to run the following test commands. You can obtain the same simple effects from the “full” model with this Stata 12 code. Let’s push things one step further and remove all of the main effects from our model, leaving only the interaction term. Again, the overall F, degrees of freedom and R2 are the same as our “full” model. This model is a variation of a cell means model in which the intercept (41.82609) is the mean for the cell female = 0 and grp = 1. The “interaction” coefficients give the difference between each of the cell means and the mean for cell(0,1). We can get a clearer picture of the cell means model by rerunning the analysis with the noconstant option and using ibn factor variable notation to suppress a reference group. This model has 8 and 192 degrees of freedom. The overall F and R2 are very different from the previous model although you will note that the sums of squares residual are the same in both models. This time each of the coefficients are the individual cell means. Even though the model seems very different we can replicate the coefficients from the previous model using lincom. For example, the first coefficient in the previous model is 7.31677 (2.458951) with t = 2.98, i.e., the difference in cell means between cell(0,2) and cell(0,1). Here is the lincom code to obtain that value. Consider the following model with a categorical and a continuous predictor. This time the overall F is 19.01 with 7 and 192 degrees of freedom and an R2 of .4094. Next, we will rerun the model without socst in the regress command. Once again, the overall F, degrees of freedom and R2 are the same as our “full” model. So, once again, this is just a reparameterization of the “full” model. In this model, the “interaction” coefficients represent the simple slopes of write on socst for each of the four levels of grp. You can obtain the same results with these Stata commands. So far, each time we have dropped a term out of the regression command the model has remained the same. Sure, the coefficients are different but the overall F, degrees of freedom and R2 have remained the same. If we drop the categorical variable (grp) from our model we will lose three degrees of freedom and the overall F and R2 will change. Let’s see What happens. This time things are very different. The overall F, degrees of freedom and R2 differ from the “full” model. This model is not a simple reparameterization of of the original model. The coefficients in this model do not have a simple interpretation. This model may, in fact, be misspecified. So here’s what’s going on in this model. 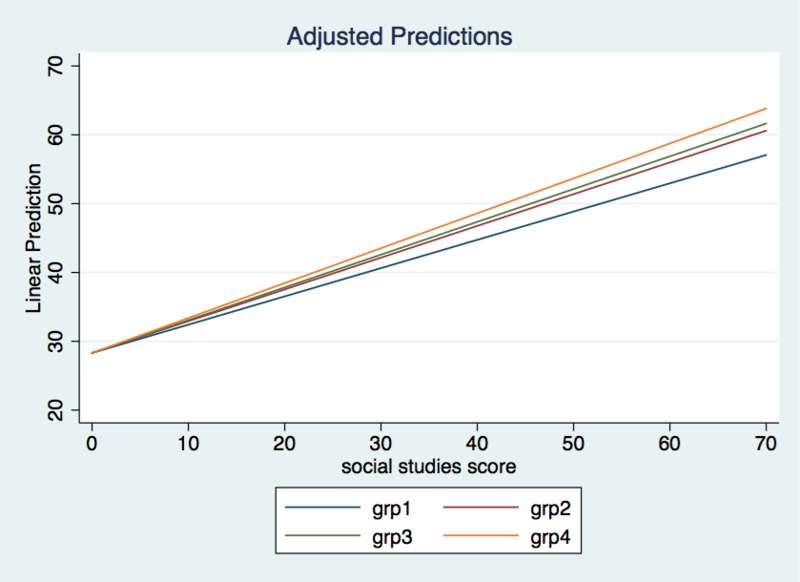 There is just one intercept for the regression lines in each of the four levels of grp. That intercept equals 28.30563. The coefficients for the “interaction” are the differences in slopes between each grp versus grp1. We can show this using the margins command. We will begin by computing the intercepts for each grp. Next, we will compute the slopes. We will include the post option so that we can compute the differences in slopes using the lincom command. The values computed by the lincom commands have the same values as the “interaction” coefficients in the regression model we ran. A plot of the model looks like this. You will need to decide from looking at the plot whether this is truly the type of model you are interested in. If the above model is very different from what you expected then you may have run a mispecified model. This time we will run an “interaction” only model. This example has exactly the same fit (overall F, degrees of freedom and R2) as the previous example where we dropped the grp term. Instead of a three degree of freedom “interaction” Stata give us a four degree of freedom term in which the coefficient are the slopes within each cell. 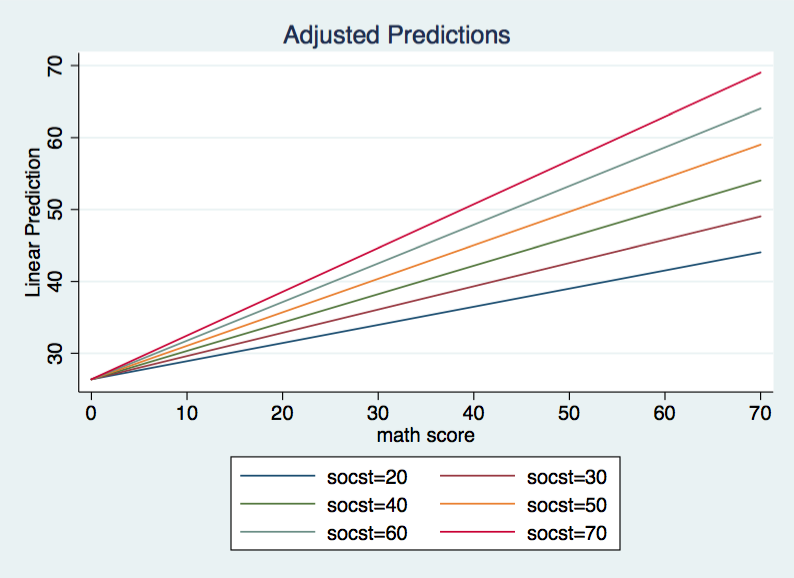 Let’s look at a “full” model using math and socst as predictors of read. The overall F is 78.61 with 3 and 196 degrees of freedom for the model and an R2 of .5461. The intercept is 37.84271 when both math and socst equal zero. For each unit change in socst the slope of read on math increases by .0112807. Here is what the graph of this model looks when plotted over the range of 0 to 70 for both variables. One way to think about this model is that there is a regression line for each value of socst. and these regression lines differ in both intercepts and slopes although they all intersect when math equals 19.51. Next, we will rerun the regression leaving the main effect for socst out of the model. Now the overall F is 117.80 with 2 and 197 degrees of freedom for the model and an R2 of .5446. Let’s jump straight to the graph of this model. 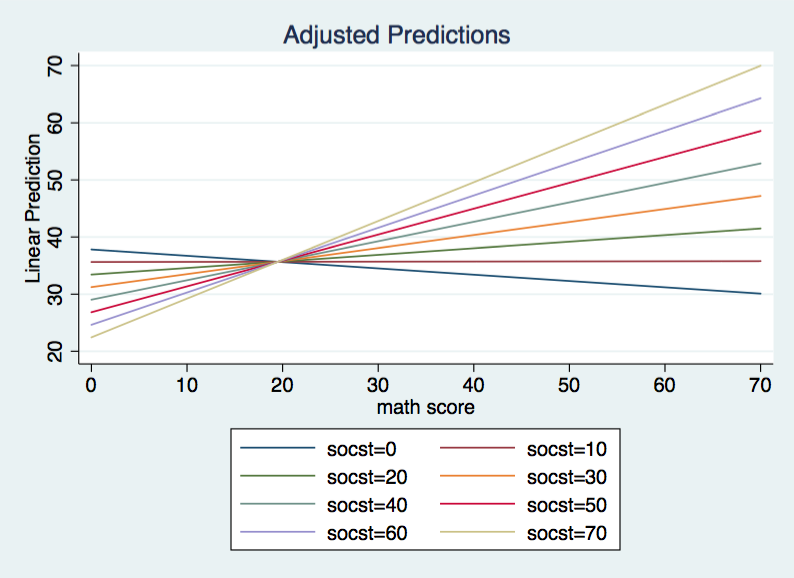 Again, we have a model with different slopes for different values of socst. However, this time each regression line has the same intercept, 26.3823. The researcher needs to decide whether this model makes theoretical sense. If the researcher concludes that the model does make theoretical sense then it is possible to test whether the data can support the model with a common intercept. Basically, we will test to see if the model without socst fits significantly worse than the “full” model. We will do this using the lrtest command. This test is equivalent to testing the coefficient for socst in the “full” model. The tests above support the hypothesis that the model without socst does not fit the data significantly worse than the “full” model. If instead of dropping socst we had dropped math the graph of the model would have looked very similar. The degrees of freedom would be be the same and the overall F and R2 would have been close. Both the intercept and “interaction” coefficient are also different, but not in any noticeable way. The same thing happens when we drop both math and socst. The graph is similar and there are small differences in the overall F and R2. The model with only the “interaction” term has 1 and 198 degrees of freedom. The most likely reason that these three model appear so similar is that when the “interaction” is in the model neither predictor is significant. Further both math and socst are scaled similarly with nearly equal means and standard deviations. When you drop one or both predictors from a model with an interaction term, one of two things can happen. 1) The model remains the same but the coefficient are reparameterizations of the original estimates. This situation occurs with categorical variables because Stata adds additional degrees of freedom to the “interaction” term so that overall the degrees of freedom and fit of the model do not change. Or, 2) The model changes, such that, it is no longer the same model at all. This occurs with continuous predictors and results in a decrease in the model degrees of freedom as well as a substantial change in the meaning of the coefficients.